It’s more common than you think, and this mum has shared her harrowing story so that you know just how easy it is for your newborn to choke on your breastmilk, and what to do if it occurs. Most new mums dream of having such an overabundant supply of breastmilk that they never have to worry if their baby is getting enough. But for some mums, this ‘oversupply’ (or even a fast letdown) can result in baby struggling to keep it down. For this mum, the end result was her baby turning blue and being rushed to hospital with fears he was choking to death. After feeding her first daughter for 18 months without a problem, mum Rebecca Taylor had never experienced this kind of reaction before, and had no idea that a baby could choke on breastmilk at all. After all, aren’t babies made to breastfeed? She shared her harrowing story in the Breastfeeding Mama Talk Facebook page, recounting the frightening details of their ordeal. She shares her feelings of helplessness and despair as she watched her baby turn blue and be rushed to hospital, hooked up to an oxygen mask “with tubes & codes being called out”, describing the moment as “one if [sic] the worst things a parent could ever witness”. 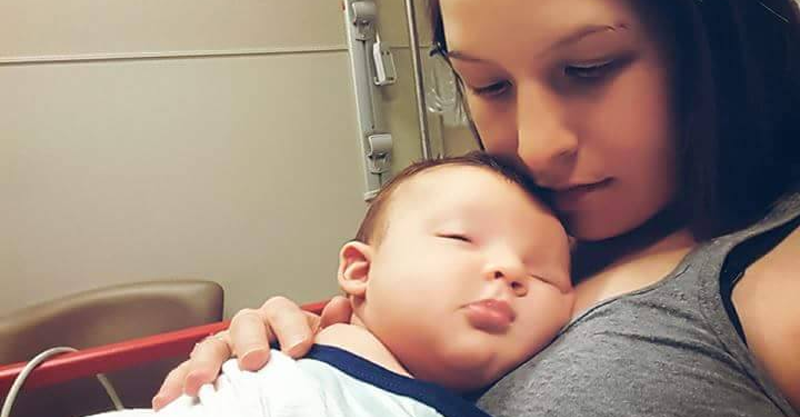 Thankfully her gorgeous baby boy recovered from the scary ordeal and, after a chest X-Ray, was sent home – with mum warned to keep an eye out for “aspiration pneumonia”. After consulting with a lactation consultant, Rebecca admits that she still felt confused and unsure about how to avoid this happening again. So Rebecca reached out to lactation consultants and breastfeeding mums at large on Facebook, and has received hundreds of comments with some great advice about breastfeeding and oversupply and fast letdown issues. What is really happening when your baby chokes while breastfeeding? When your baby starts coughing, choking, and struggling to breath while breastfeeding it is a sign that they are aspirating, which means that your milk has entered their airway or lungs by accident. If left untreated this can cause serious health problems in your little one, such as pneumonia. Aspiration is often caused by dysphagia, a condition where the muscles that direct the liquid from the mouth down the throat into the oesophagus and into the stomach don’t work properly, causing swallowing problems. If your baby is presenting with any of the above signs of aspiration while feeding, talk to your doctor straight away for treatment. We are so glad that Rebecca’s beautiful little boy has recovered and is doing fine now after their scary experience! Did your baby ever choke on breastmilk or struggle with a forceful letdown or oversupply? Share your stories.